As you approach the last 30-45 days prior to the wedding, you’re surely feeling excited, anticipating the actual day. You’ve may be running through all the magical moments you and your Groom will share together. Or you may even be feeling exhausted by the stress experienced throughout the planning process and just ready for the wedding to be finished so you can enjoy being married. In any of the 3 scenarios, the details you address in the last remaining days leading up to the wedding can be the most critical. During this time will be when you finalize the finer points and smallest of details. Anything from how the napkin will be folded, where will the bridal party stand during introductions, who will transport the guest book to the reception, timing the set-up of the reception vendors in logistical order so that everything runs smoothly. All of the details can make or break a Bride’s wedding day experience. 1. Schedule a meeting with your reception venue to do a walk-thru meeting. During this meeting you will finalize the room layout, the time the reception space will be available for set-up, review menu items and pricing. On average, final numbers are due 3-7 days prior along with payment. 2. Schedule a time to meet with your florist to finalize all final count, colors. Utilize the floor plan to designate the location of the tall centerpieces. Provide the florist the load-in details and times. You will need to finalize the time/location which the personal flowers will need delivered. 3. Finalize contract details, final payment, set-up times, and discuss the floor plan layout/set-up details with the remaining vendors; DJ, linens, rental items, ice designer, cake, church and entertainment. Do not leave a single detail to chance. Make sure to ask each vendor for their event day staff names and a cell phone to contact them on the wedding day if an emergency were to occur. 4. 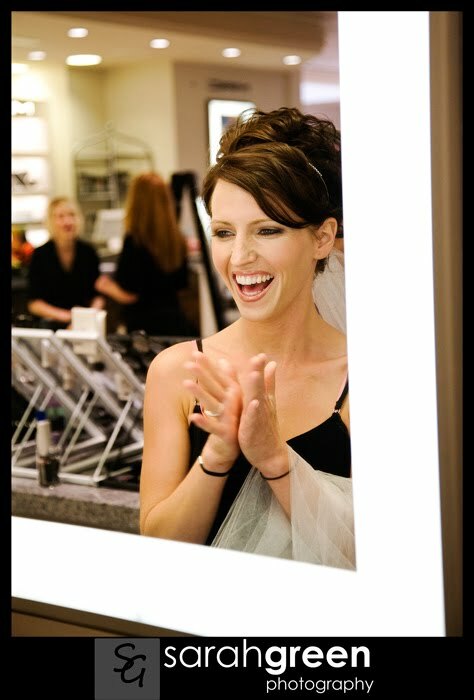 Create a make-up/hair schedule for your bridal party. Allow 1 hour for your hair and 1 hour for your make-up. Allow 30-45 minutes for each bridesmaid for hair and the same amount of time for make-up. As a helpful tip, never make your last as it could cause you to run late and always put your most picky bridesmaid last. Distribute the schedule to your party 2 weeks out. 6. Confirm with your bridal party that their dresses are altered and pressed. This will need to be done no less than 2 weeks prior to the wedding. Confirm that the groomsmen have ordered and paid for their tuxes. With groomsmen, we know our fellows well and how no nonsense they are. Remind them to try on the tux at the store to confirm all items fit and are the correct size. If they wait until Saturday morning, it could be too late. 7. AND, most importantly, don’t forget your dress. Your dress should have been received and fitted already if you had bridal portraits. If you opted to not take bridal portraits, you will want your fittings to start no less than 40 days out. At your last fitting, bring two bridesmaids with you to ensure they understand how to bustle the train. Schedule your dress to be pressed and packed for transportation the Thursday prior to the wedding. It would be ideal to designate a family friend or bridal party member to pick it up on Friday prior to the wedding. Ultimately, it would be the ultimate luxury to hire a personal dresser to pick up your dress the day of the wedding, deliver the dress to you and assist you in putting it on. Saks 5th Avenue and companies such as Misti Style provide this service. 8. The last remaining and most vital tools for a successful wedding still remains; “The Timeline”. This topic is truly so big and incredibly important, it deserves it’s very own post. Stay tuned for Part III as I cover the tips and strategy for writing a flawless timeline.